Over 50 enemy attacks were recorded. The situation on the line of contact in Donbas has remained tense over the past 24 hours, as militants fired at the positions of the Joint Forces 51 times, including from large-calibre artillery, wounding three Ukrainian soldiers, the Ukrainian Defence Ministry has reported. "Three our defenders were wounded as a result of enemy attacks. They were evacuated to mobile military hospitals. The condition of our military is satisfactory," Defence Ministry spokesman Dmytro Hutsulyak said at a briefing on 3 May. In the Luhansk sector, the Svitlodarsk salient was the hottest spot. The heaviest escalation of the day was observed near Troyitske and Svitlodarsk, where militants used 120-mm and 82-mm mortars, infantry fighting vehicle guns, grenade launchers and small arms of various types and calibres. Over 120 mines of various calibres were fired at Ukrainian troops. "Of the 14 attacks generally recorded over the past day in the Luhansk sector, 10 occurred exactly at the Svitlodarsk salient," he said. Ukrainian strongpoints near Zaytseve and Novhorodske came under enemy fire. Militants used 82-mm mortars, grenade launchers and small arms there. Thirty-seven attacks were recorded in the Donetsk sector, the heaviest of them near Avdiyivka, Maryinka, Vodyane and Shyrokyne. "In violation of the Minsk agreements, the Russian occupying troops once again used 122-mm artillery. From about 4 p.m., 39 122-mm artillery shells were fired within an hour at our military near Vodyane and Shyrokyne," the report said. In addition, Ukrainian strongpoints near Vodyane came under enemy fire twice from 120-mm mortars: "Our military counted 30 explosions of mortar shells." Ukrainian servicemen staying near Avdiyivka, Lebedynske, Opytne and Pisky also came under 82-mm mortar fire. Small arms, large-calibre machine guns, grenade launchers of various types and infantry fighting vehicle guns were used to fire at Ukrainian positions near Avdiyivka, Vodyane, Kamyanka, Maryinka, Lebedynske, Novotroyitske, Opytne, Pavlopil, Slavne and Shyrokyne. 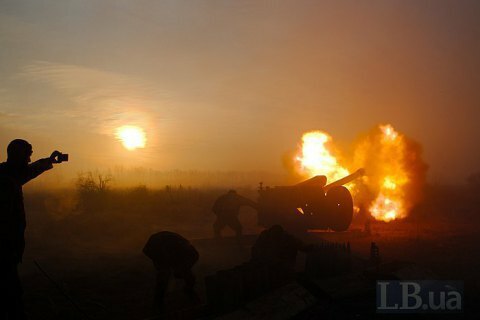 "The militants of the Russian occupying authorities fired 39 122-mm artillery shells, about 100 120-mm mortar shells and 80 82-mm mortar shells at the fortiications of the Joint Forces. In order to preserve the life and health of the personnel, servicemen of the Ukrainian Armed Forces opened fire 44 times, using only weapons that are exclusively permitted by the Minsk agreements," the Defence Ministry said.